NOTE: The following story comes from the Foundations Health Solutions Website. Each month, nursing home developer Brian Colleran honors an extraordinary caregiver who goes above and beyond to exceed expectations for each resident. This month, Heritage of Hudson's very own LPN, Aaron Brandner won this award. Check out the story below, and see the Foundations Health Solutions link to learn more. Heritage of Hudson LPN Aaron Brandner is the latest extraordinary caregiver to win the prestigious Brian Colleran Caregiver of the Month Award. Aaron is not only a great blessing to her residents and family members, but is also highly respected among her team as being a great example and inspiration. Aaron has been at Heritage of Hudson for 3 years, and has nearly ten years nursing experience. She has found comfort in the homelike environment at Heritage of Hudson, and knows she belongs in Long Term Care. She enjoys working with fellow staff and compliments the ease at which they jump in to help when needed. Aaron frequently has gone above and beyond for our residents and families. Aaron has shown examples of medical awareness before, when she made a recommendation for a resident to receive a special medication. She pulled on her past experience with a similar resident and recognized the applicability of the medication to the residents needs. This allowed her to consult with the doctor and the resident was prescribed the medication. The resident’s condition has greatly improved and his quality of life is significantly better. It is stories and compliments like these that remind the residents and staff how lucky they are to have an employee like Aaron. Aaron’s dedication to the residents and willingness to advocate for their care is one of the many special traits about her. 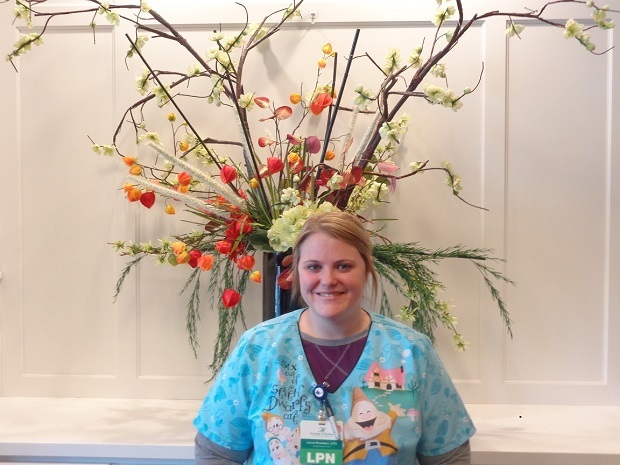 Aaron is always smiling in the facility, and her positive attitude is contagious to the residents and fellow staff. Aaron graduated from Stow High School, and received her Nursing License shortly after. She has been working hard ever since, raising two children, and their pet dog and cat. Aaron loves spending time with her family and his taking a vacation with them in April. Aaron is a shining example of the type of caregivers that Brian Colleran likes to partner with to raise the bar in the field of long term care with excellence in resident satisfaction and clinical outcomes.